Pickleball. Have you heard of it? Makes me think of charades. Two words. First word. Sounds like tickle. Pickle. Second word. Sounds like wall. Ball. Pickle, ball. Pickleball. It’s a game. Sort of a cross between badminton, tennis, and ping-pong. It is played on a badminton-sized court, which is about one-third the size of a tennis court, with paddles and a ball that is similar to a wiffle ball. The net is two inches lower than a net on a tennis court. The ball moves about one-third the speed of a tennis ball. It is supposedly easy to learn, but can develop into a quick, fast-paced game for experienced players. I’ve been hearing about pickleball here and there. When the improvements were done at Lincoln Park last year, pickleball courts were built, complete with lights for playing at night. I read that indoor pickleball happens at the Lincoln Park Barn during the winter months. I also know that it’s a quickly growing sport, especially among the retiree set. Easy to learn. Fast-paced. Can be played out-of-doors, free-of-cost. Can be played at night under the lights. Can be played indoors during the winter. Is doable as singles or doubles. I think I want to try this game. I dabbled in tennis, as a kid, and then again in my twenties. I liked it, but it was obvious that I would never be that good at it because I’m not very fast on my feet and there is a lot of area to cover on a tennis court. Consequently, I got into racquetball, which is similar but has a smaller court. I do alright in racquetball, even without being a fast mover. I play racquetball three times a week, usually with my friend Jim. Lucky Jim. I’m going to get him to try pickleball with me. We’re not looking to replace our racquetball time with another sport. And we’re not of retiree age (yet). But I can totally see us riding our bikes to the courts on late summer evenings to play a little pickleball under the lights. And maybe we’ll win the Pickleball National Championship 60+ age group if we start playing now. Jim’s birthday is today. Lucky Jim. He’s getting a pickleball paddle and some wiffle balls for a gift. 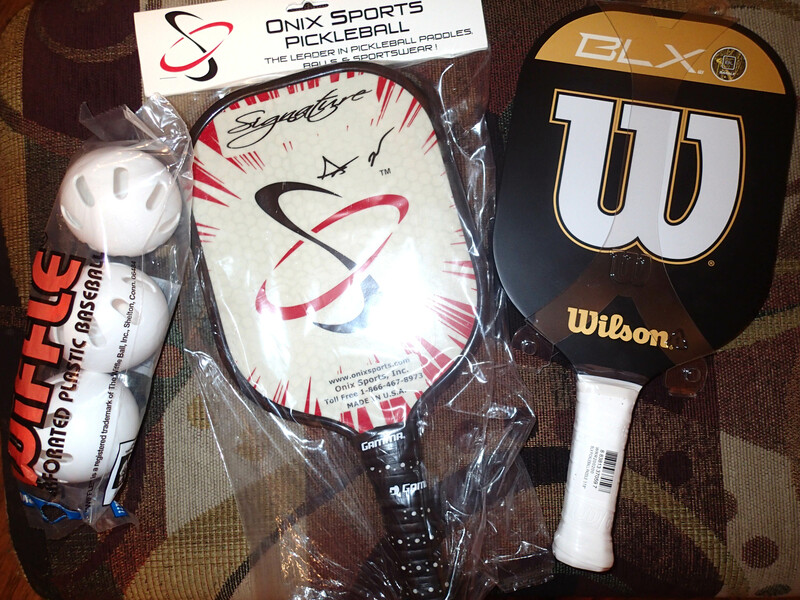 I got a little gift for myself, too–a pickleball paddle. I did some quick research on paddles before buying them. Fortunately, Sports Authority had a few in stock. An employee there said they’ve been selling like crazy. They were out of official pickleball balls, but they are similar enough to wiffle balls so I bought a bag of three wiffle balls. What I know about the paddles is that they come in wood or composite (graphite) material. I believe the composite paddle is slightly heavier, thereby requiring less strength to hit the ball as hard or as far as you might with a wooden paddle. There is only one size of paddle, but the handle size can vary. Larger hands do better with a wider handle. At Sports Authority, there were three different paddles to choose from. They all looked about the same to me. The one major difference was that one was “rimmed.” It had a raised edge. The others were rimless, “for increased maneuverability and faster play.” I hadn’t read anything about that online, so I decided to get one of each type. And here’s what else I know about pickleball paddles: they’re not cheap. I couldn’t believe that they cost more–two or three times more–than a basic racquetball racquet. I guess that means that we WILL like this sport. It’s mandatory, now that I’ve invested in two paddles. I looked through my Parks and Rec Activity Guide and was surprised to learn that there were no pickleball classes being offered. There was, however, a number listed for Grand Junction Pickleball. Grand Junction Pickleball? There’s a club? Now I know for sure the sport is taking off. I gave the number a try and talked with a nice man named Ken. He explained that Parks and Rec does not offer classes in the winter because there is not enough indoor playing space. I will look again in the next Activity Guide that comes out in the spring. Until then, Jim and I will try to hit the wiffle ball back and forth. We can use the outdoor courts on nice weekend days or the basketball or racquetball courts at Gold’s Gym. Tonight, while we were out to dinner, Jim opened his gift and we hit the ball back and forth a few times right there in the middle of the restaurant. Oh, and about that name Pickleball. Legend has it that the creator of the game had a dog named Pickles. Every time the ball, which belonged to the dog, was mishit, Pickles would grab it and run and hide in the bushes. They named the game for their dog’s ball, Pickle’s Ball, which became Pickleball. That’s how the story goes. Leftovers–a little tennis, a little badminton, a dog’s old wiffle ball, some make-shift paddles. And some more truth: the Pritchards didn’t get their dog until a few years after they invented the sport. So, the dog was named after the sport. I’ll let you know, as the months go on, if Pickleball is any fun. In the meantime, you might want to check out this short video. Previous France Vicariously Next What’s Coo5king?